Vintage Adventurer | We made it! 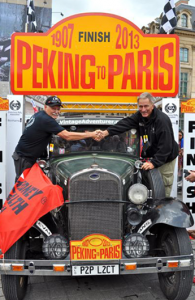 After 33 days and over 12,000km, we made it all the way from Peking to Paris! • Philip Young, Founder & Director of the Endurance Rally Association – For providing a magnificent event. This adventurer would not have been possible without our wonderful, dedicated sponsorship partners – thank you. A special acknowledgement for the assistance provided by both Andy and Stephanie that made it possible for Tudor Rose to stay on target and drive over the finish line in Paris. I would also like to thank all the entrants that participated for the kindness and goodwill they extended to me and a special thanks to those that made the P2P the event it is. A real special thanks to my wife Nola and daughter Louise. They fought adversity to make it to Paris two days before the end of the P2P where Nola dialysed so she could welcome me and Tudor Rose over the line. Nola and Louise then made a quick dash back to Australia for dialysis treatment that started at 11pm Tuesday and finished at 5am Wednesday. We hope our participation in this event has helped to create awareness for kidney disease and to raise funds for Kidney Health Australia. It’s not too late to donate!